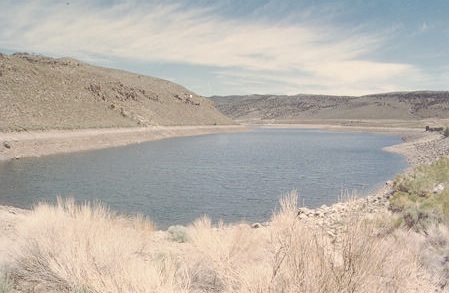 Mill Meadow Reservoir is located northwest of Loa at the base of the Fish Lake Mountains just below the confluence of the Fremont River and U M Creek. Public access is unrestricted. The impoundment, an earth-fill dam, was built in 1954. Water from the reservoir is used primarily for irrigation and other agricultural purposes. Continue north for 2.5 miles to FS-036, a paved road to Johnson Valley Reservoir. Mill Meadow Reservoir is 2 miles up this road. From the north, travel 27 miles south on U-72 from Fremont Junction to FS-036.